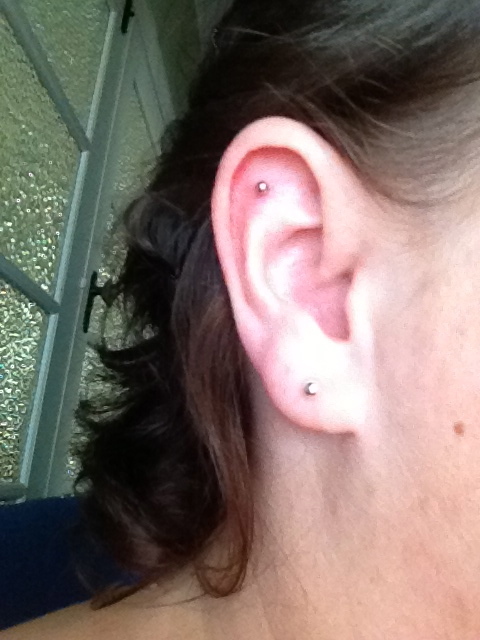 At the bottom of the Garden: New Upper Conch Piercing! Well, after a fairly crap week, where we've had to decide to cancel Bryn doing the school swim program and Erik and Lukas participating in the year 5/6 fun day because we just don't have the $130 these things would cost, it was nice to end on the week with a bit of fun and long wanted piercing - that cost not a cent! The opportunity presented itself on Thursday to get a free piercing on Sunday (today), including free jewellery, at an end of year training facility. Basically we'd be helping out graduating piercing students by allowing them to pierce our body, under close supervisor of a qualified and highly experienced couple of piercers. I could not pass up such an opportunity! Was it very painful? No, it wasn't. There was pain, maybe about a 4 for me (my first nose piercing was a two, the second time it was about a 7), but it lasted two seconds, then that lovely warm feeling spread through my ear. I was told pulling the tube out might hurt, but I didn't feel that part at all. 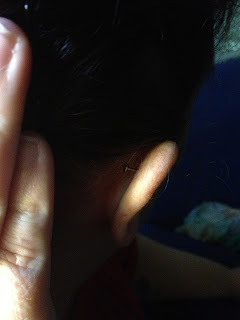 My friend, Jayne, also hard her ear done - slightly different position - and generally speaking she feels pain more acutely than I do, but she didn't feel any pain at all (she had a professional do hers, whereas mine was the last graduate off the rank. My graduate did a brilliant job, but was maybe more hesitant than the attractive young professional who did Jayne's ;)). The waiting is always the most painful part and we had to wait for a while with a bunch of 20-somethings who had all had several piercings and were intent on reliving every horror story and comparing pain levels and what not - I kind of just wanted them to shut-the-truck-up. It's always exhilarating getting a new tattoo or piercing done! Getting it done for free is just a huge bonus! 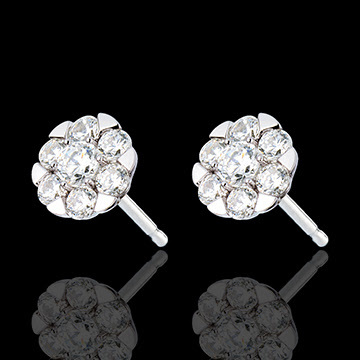 I'm keen to get my second holes re-done now that I know that a needle piercing is much better than a gun piercing, and I would also like to get my tragus done. We're going to find out where the guy works who did Jayne's because he seems very good - and he has nice cool hands (he offered to hold my hand when I had mine done and he got the clammy end of that bargain)!